I've been writing for a few years now, but I'm still perfecting my writing process. I learned recently that using pen and paper helps me brainstorm faster and more completely. I've also learned that although I can write a story organically, it is much harder and slower than if I develop a rough outline and break the story down into individual scenes before I start writing. Since it may help others, I want to share that part of my process. A scene is a set of characters, in a given location, doing the same thing, over a continuous period of time. If the characters, location, activity, or timeframe change, it may (but does not have to) constitute a new scene. For example: Joe and Jane are washing dishes after dinner. They discuss a murder that occurred in the neighborhood. Jane leaves, telling Joe that she is going to water the begonias. Joe continues washing the dishes. He remembers their vacation to Fort Lauderdale last year and how amazing Jane looked in her bikini. Is this one or two scenes? We could split the scene into two at the point where Jane leaves, since the cast of characters changed. This could make sense if we think we might drop the bikini memory later, or if we are thinking it might make sense to have it occur at a different point in the story. On the other hand, since the dish washing activity continued and the point of view never left Joe, we could decide it's still the same scene. We might also decide it's important to keep the murder discussion and bikini memory together, especially if we want to depict Joe as the killer and use the bikini memory as a way to show his lack of genuine concern about the murder. In other words, the writer gets to decide whether it's appropriate to break this into two scenes, or keep it as one. Ultimately, as bestselling author Aaron Allston always says, the only rule is "Do what works for the story." 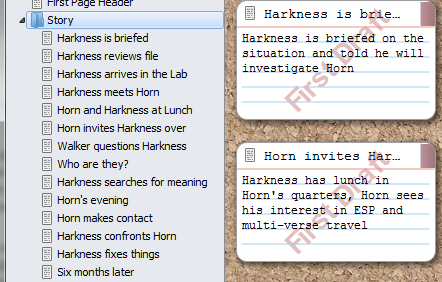 In the example above, I have scenes like "Harkness is briefed" and "Harkness reviews file". On the right-hand side of the screenshot you see virtual index cards created for each scene. I'll add, remove, and rearrange these scenes until I'm happy. All I've written to this point is a brief description of each scene, but I have a good picture of the entire story I'm about to write. The key for me is to write scene notes that are "detailed enough" so that I know what I'm trying to accomplish, but not so detailed that looking at the notes makes me feel like the scene is already written (which can make writing that scene feel redundant). My scene notes may be very detailed: "Tom and Fred borrow Charlie's prized Corvette. They go a little crazy outside of town, and drive really fast down a twisty road. In the process, a hub cap comes off the car and rolls into the swamp. They know they can't take it back to Charlie like this, and since he's got custom hub caps, they can't just buy a replacement. They need to find the lost one." Writing a scene from these notes should be very easy. In other cases, my notes are vague: "Tom and Fred search for the hub cap." I might choose to write this scene organically (i.e., "seat-of-the-pants style") or wait until I've brainstormed it more fully. Breaking a story down into small scenes makes it easy to employ the pomodoro technique. If you only have a few minutes to write at a session, knowing the individual scenes you need to write makes it easy to find one you can create in the time available. This is a big help when writing isn't your day job! As you mark individual scenes "written", it's easy to see the progress you're making toward completing the whole story. That can be very motivating. Since you know all the scenes you need to write, you can write them in any order that appeals to you without worrying that you'll miss one. Adding, removing, and reordering scenes to improve the story is much easier when the story is broken down into scenes from the start. You may want to try this approach (whether or not you use Scrivener). I found it a great way to quickly complete NaNoWriMo, and improve the plotting and structure in all of my stories.